Chocolate & Zucchini :: View topic - Got any interesting cranberry recipes? Posted: Sun Nov 04, 2007 5:51 am Post subject: Got any interesting cranberry recipes? Costco had 3# bags of cranberries so I'm set for life. I made my cranberry sauce for Thanksgiving. I made cranberry quickbread. Then I made cranberry scones. I bet I've got 2# left. So what do I do with them? all the ones I've found online so far are more complicated. I mean, orange peel in with the cranberries, sure. Spices, fine. All the recipes say to melt the butter and stir in the cranberries until coated. I have never done this and it's always been tasty. I will re-post with proportions once I get my hands on the recipe, but it's at my mother's house. Rainey, your knack for breads will cause you to invent a savory cranberry bread to be used for stuffing chicken breasts, long after the turkey is gone. are some fancy Christmasy bars ("Cranberry Turtle Bars"). 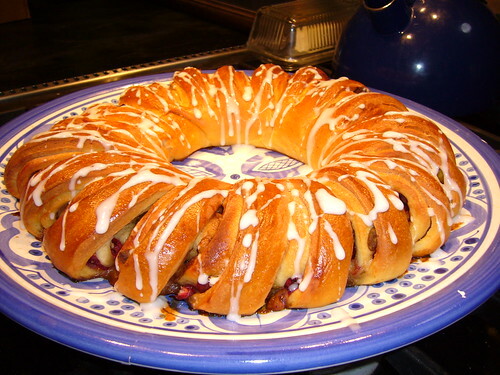 I have a lovely recipe for a cranberry-walnut yeast bread that is a very pretty braid and makes a mean bread pudding. But that uses dried cranberries. Warm up legs with one mile of walking and cup of espresso. Recycle cup, pause to stretch and head north. Brace against chill of cranberry-laden trucks whooshing past. Pound pavement and smash loose, rolling cranberries fallen from said trucks underfoot. Staining on shoes is indicative of good progress. Run four miles, test for doneness with Out Of Breath or Falling Down test. Remove shoes and scrape off cranberry sauce. I did a search for the recipe online & found this, similar, more complicated but sounds good too. Heat oven to 300°. Place walnuts in the bowl of a food processor and pulse until ground, making sure not to overprocess into a paste. Add flour, 1/3 cup sugar, salt, and sage and pulse to incorporate. Add butter and pulse to form a coarse meal, about 30 seconds. Press dough into an ungreased 10-inch springform pan (or an 11x8-inch tart pan with removable bottom). Bake until light golden brown, about 55 minutes. Cool completely, then release from pan. In a small saucepan over medium-low heat, cook preserves until melted. Add cranberries, remaining 1/3 cup sugar, and cherry brandy. Bring to a simmer, stirring occasionally, and cook until cranberries have lost their shape, about 25 minutes. Remove from heat and let cool completely, about 1 hour. Spread Gorgonzola over tart crust in a thin, even layer. Top with a thin layer of the cooked cranberry mixture. Garnish with sage and walnut pieces. Divide into 10 even slices. Thank you! The first one sounds like it would be a brilliant appetizer pre-T-day dinner. I'm betting it was dried cranberries but I've got enough to bake some fresh ones for 20 minutes and see if that does the trick. ALL these recipes look great. And here are two more that were in the SF Chronicle this morning. They both look very interesting and tasty! Instructions: In a medium-size skillet or wok, heat 2 to 3 tablespoons oil over medium heat. Add the onions and cook until they start to become translucent, then add the garlic. When garlic is aromatic, add the mushrooms, butter and season to taste. Cook a minute before adding the wine; continue to cook until wine is reduced by at least half. Add the cranberries, cranberry juice, broth and thyme sprig. Simmer until juice and broth are reduced and mixture is slightly saucy. Remove thyme sprig; taste and adjust seasoning. Add brown sugar, if needed, to balance the tartness of the cranberries. Mixture can be made up to a day ahead and refrigerated. Per 1/3 cup: 155 calories, 3 g protein, 14 g carbohydrate, 9 g fat (3 g saturated), 10 mg cholesterol, 17 mg sodium, 3 g fiber. Instructions: In a large pot of well-salted boiling water, cook the wild rice until it is still al dente but grains are not split, about 20-30 minutes depending on the brand of rice. Drain and set aside. In a small- to medium-size pot with tight-fitting lid over medium heat, add 2 tablespoons oil. Add the onions and saute until translucent then add the garlic. Continue to cook until garlic starts to turn golden. Add the jasmine rice, plus more oil if needed to prevent burning, and cook, stirring occasionally until the rice becomes translucent. Add the white wine; cook until absorbed. Add the wild rice to the pan along with the thyme sprig, dried fruit, salt to taste and hot water. Bring to a boil; cover and reduce heat to low. Cook for 20 minutes. Remove pan from heat and leave covered for 10 minutes. Remove thyme sprig; stir, taste and adjust seasoning. Garnish with pecans and optional parsley. Per 1/2 cup: 215 calories, 4 g protein, 29 g carbohydrate, 9 g fat (1 g saturated), 0 cholesterol, 3 mg sodium, 2 g fiber. As I type I have the Pistachio Bread from Beard on Bread made with chopped cranberries as well as the nuts rising in the kitchen. Not sure how it will turn out. I tried to compensate for the tartness of the berries and we'll see if I did it enough. Not too bad. The cranberries are such a beautiful, vibrant red color (not too apparent in that pic). Wish the pistachios had been as saturated a green. I'll have to tinker with the flavor but it wasn't bad. I'm not sure I'm patient enough to leave it for a week though! try cranberry salsa (boil up a package of fresh cranberries with 1/2 c sugar and 1/2 c fruit juice (combo orange/lime nice, but anything will do). when cranberries pop, turn off heat and put a cup or less in the blender with some fresh coriander/cilantro and a handful of those jarred slided jalapenos. depending on your taste, add as many as you want, but start small. think of your audience/victims, heh heh. put everything in a container and season with salt/pepper. mmmm, great as a side condiment. also good for appetizers... put on bread with cream cheese. satisfies sweet/sour/spicy in one go. seasonal. but not for traditionalists. Measure the sugar, reserve. Zest the tangerines. Reserve the zest, covered. Juice the tangerines, measure the liquid and add water to make 8 fl. ozs. of liquid. Add the cup of sugar to the juice in a sauce pan. Stir to dissolved. Put the pan over heat, bring to a low simmer, whence add the cranberries, cover and simmer 10 to 12 minutes to burst the berries. Allow to cool for 10 minutes off the heat, add the reserved zest. Stir. Cool to room temperature and refrigerate. Notes: If you can get more than 1 tablespoon of zest, that is better, but 1 tablespoon is the minimum. I thought of using tangerine juice & zest in Albuquerque New Mexico in 1994. I know this is probably weird, but I use my stash of frozen post-Thanksgiving sale cranberries for hot cranberry juice whenever I have one of those real winter showstopper colds (unfortunately they have them in LA too, don't ask, don't ask). Basically just a quart of water, enough cranberries to cover the surface (a cup or more), and a bit of sugar--not nearly as much as for cranberry sauce, maybe 1/4 cup and then more to taste, or else leave it out altogether and add sugar to taste by the mugful afterwards. If you like cloves, add a couple, and boil or nuke a few minutes to cook the berries. It's more fresh/green/floral tasting than the stuff you buy at the store, though not as concentrated and red, and it seems to soothe my throat better as well--not sure why. More normal dessert idea-- I've seen/tasted at Europane here in Pasadena, but never tried at home, cranberry/pistachio biscotti that were really more like well-browned shortbread, very rich, with well-toasted pistachios, and the cranberry tartness cut in perfectly. Man were they good. I am not allowed back in the bakery or else. "It's watery....and yet there's a smack of ham."